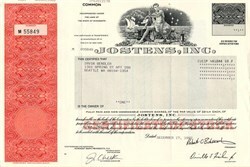 Beautiful certificate from the Jostens, Inc issued in 1997. This historic document was printed by United States Banknote Company and has an ornate border around it with a vignette of an allegorical man next to a globe. This item has the prinhted signatures of the Company's President and Secretary and is over 11 years old. Jostens, Inc. provides products and services that help people celebrate achievement, reward performance, recognize service and commemorate experiences. Products and services include yearbooks, class rings, graduation products, student photography packages, customized business performance and service awards, sports awards and customized affinity products. The company's operations are classified into two business segments: School products and Recognition. School products include elementary through college yearbooks, commercial printing, desktop publishing curriculum kits, class rings, graduation announcements and accessories, alumni products, individual and group school pictures and senior graduation portraits. School products comprises five businesses: Printing and Publishing, Jewelry, Graduation Products & Photography. Recognition segment designs, communicates and administers programs to help customers improve performance and recognize employee service. The products manufactured by Recognition include customized and personalized jewelry, rings, watches and engraved certificates. Products are sold in the United States and Canada. School products accounted for 86% of 1999 revenues; recognition products, 13% and other, 1%. Financial History On October 4, 2004, Kohlberg Kravis Roberts & Co. (KKR) and DLJ Merchant Banking Partners III, L.P., an affiliate of Credit Suisse First Boston's Alternative Capital Division ("DLJMBP"), announced the completion of transactions which put Jostens, Inc., Von Hoffmann and ARCADE Marketing, all three companies leaders in their respective markets and previously owned by DLJMBP, under one company owned by KKR, DLJMBP, management and certain other investors. The three companies are subsidiaries of Visant Holding Corp. and Visant Corporation and form a specialty printing and marketing services enterprise. Previously, on July 29, 2003, CSFB Private Equity and Jostens, Inc. announced that DLJ Merchant Banking Partners, III, L.P. completed its previously announced acquisition of Jostens, Inc. from Investcorp, MidOcean Partners and other Jostens shareholders at approximately $48 per common share in cash. CSFB Private Equity, the global private equity arm of Credit Suisse First Boston, is the largest private equity manager in the world, with more than $28 billion of assets under management. DLJ Merchant Banking Partners III, L.P., is a fund managed by CSFB Private Equity. Previously, on May 10, 2000, Investcorp, Deutsche Bank and members of senior management had purchased approximately 94% of Jostens' shares for $25.25 per share. After the completion of the takeover, Jostens was delisted from the New York Stock Exchange and the ticker symbol JOS expired. History from company press information and oldcompany.com.